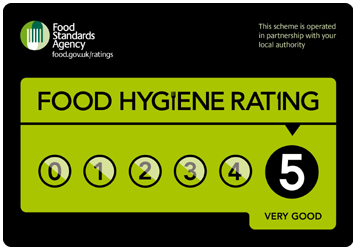 Food Hygiene Rating and why Caterers in the UK Need It. Food hygiene is a very important issue withing the UK catering industry. The importance of making sure that any catering outlet or outside caterers have been given a rating by their local environmental health officer can not be over estimated. Although the rating can not give you a guide on how good the food tastes, it will give you a good indication if the food that you will be consuming is fit and won’t cause you harm. Who gives the food hygiene rating? Every council in the country has a Environmental health office and can be contacted through your local council. Their role is to ensure all food businesses within the scope of the scheme will be inspected by our Environmental Health Officers and given a rating based on their compliance with the legal requirements for hygiene, structure and food safety management performance. The different ratings are 0, 1, 2, 3, 4 and 5 (5 represents very good compliance levels and 0 highlights urgent improvement is necessary). You can also find ratings for businesses in the whole of England and Wales as well as more information about the Scheme by visiting the Food Standards Agency website. What if a food outlet doesn’t have a rating? If you intend to eat at a fixed location like a restaurant they should have their food hygiene rating stuck on the door or window in clear view for you to inspect. If this is not visible be sure to ask to see their rating. If they can not supply you with this information I would suggest that you find another food outlet to eat from. Outside caterers should also have this information at hand should you wish to see it. Does Your Paella hold a food hygiene rating? Yes we have a 5 Star food and hygiene rating and have held 5 stars since we started our business in April 2011. You can check out more information about our catering business if you click here. https://www.yourpaella.co.uk/wp-content/uploads/2018/04/food-hygiene-rating.png 249 355 Gary Evans https://www.yourpaella.co.uk/wp-content/uploads/2019/01/logotrans1-300x106-300x106.png Gary Evans2018-04-09 10:48:062018-04-09 11:04:59Food Hygiene Rating and why Caterers in the UK Need It.